Today, Charlie Young took the reins at 110-year-old real estate brand Coldwell Banker; the new CEO transitioned from another Realogy Franchise Group brand name, ERA Real Estate, and he spent a few minutes talking to us about coming back to Coldwell Banker (he was previously both COO and CMO for the company) and what his plans are for the future. Inman: What have you done so far on your first day back at Coldwell Banker? Charlie Young: It’s been a great start, a great morning for me. It’s been a rather routine day. I have been involved in some normal operating meetings with our parent company, Realogy, which I have been involved in the last seven years in my role as ERA president and CEO. In some ways, it’s a very normal day. 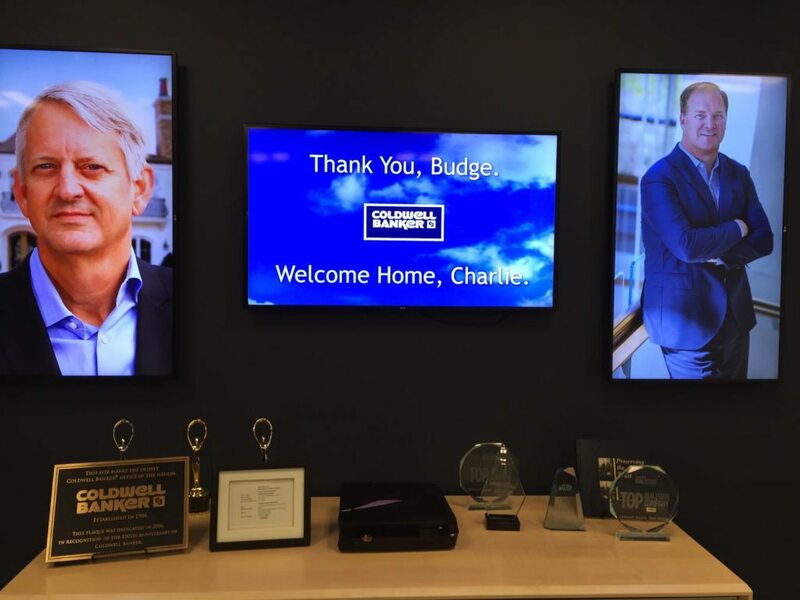 A display greeting Charlie Young on his first day as Coldwell Banker’s CEO. I was greeted this morning with the guys in the Coldwell Banker section of our building inviting me over, and I’ve got a full slate of meetings with our Coldwell Banker team later this afternoon. You just made a brand transition as an executive — that’s something our readers are familiar with; real estate agents tend to reach a point in their careers when it’s time to move on. What advice would you have for Inman readers about picking the right brand and brand transitions? I’ve been a Realogy employee for 12 years, and I was previously the COO at Coldwell Banker, and prior to that, the CMO at Coldwell Banker. All told, I’ve spent approximately five years with Coldwell Banker, so I have great familiarity with the brand and I’ve been watching the brand up close for these seven years I’ve been at ERA. In the six weeks or so that I’ve known I’ve been going to make that transition, I’ve been able to dig under the covers and become reacquainted not just with the staff but also with the brokers and agents. I’m able to hit the ground running. To answer that really quickly, I believe and I have always believed that the Coldwell Banker brand is the most powerful — perhaps the most iconic — brand in all of real estate, and it really transcends not just real estate but also American culture. I’m really excited to be back on the team. We have great agents, absolutely fabulous franchisees and companies representing the brand in some of the best markets in America. From an agent’s perspective, and even an office manager or someone who runs a brokerage company, you can’t underestimate the value of brand. I know that we are in an industry where there is a lot of emphasis put around self-promotion and the importance of building your individual brand, but the halo effect of a brand on your ability to produce — it can’t be underestimated. Coldwell Banker has received a premium position in the marketplace when you look at average sales price compared to other companies in the marketplace, and that is really a function of brand. In my position, I think that I will certainly be better suited to lead Coldwell Banker because I’ve had exposure to other points of view. But I’m not selling to a consumer every single day, and as an agent, I think you really have to be focused on: how do you present yourself from a value perspective to the marketplace and to your consumers. Both Coldwell Banker and ERA are Realogy brands, but what differences do you see between the two? Let’s start with similarities. I think that they’re both great organizations, they have great people associated with them. You have terrific leaders within the field, people operating companies, whether it’s in the company-owned Coldwell Banker stores from Realogy’s NRT division that occupy some of the 35 best markets in America to the franchisees in the Coldwell Banker system. When you look at ERA as well, you see leadership in those markets. The biggest difference that you would find is cultural. And that’s a little bit hard for me to answer in an interview question, so I will say they both represent great, strong cultures with really strong beliefs in their brand, as the way they view and execute that culture are very different. Coldwell Banker has a 110-year legacy, ERA has a 45-year legacy that’s really proud and strong with its roots and heritage. Coldwell Banker has made it a point to help educate its agents and brokers about smart home technology in particular — can you talk about that and other initiatives you might be working on? Here’s my thought on the smart home piece — I’ve been very impressed with it, I think what it demonstrates is Coldwell Banker’s commitment to leadership and innovation, and innovative thought, so in the smart home arena, we have the brand leading the agent population down a path that says, “this is an area that’s going to be important to focus on in the future, and we’ll get a competitive advantage for you in gaining listings.” The way they’re starting to package that from an education and marketing tools standpoint is really strong. Smart home is not the only thing that the brand is doing from an innovation standpoint. CBX is something I know Inman has covered in the past. CBX is a really cool, proprietary listing tool that taps into big data and helps drive pricing and marketing positioning decisions, helps target buyers and where they’re likely to come from. And I think the third is the commitment Coldwell Banker has made to the Zap platform, a lead generation/lead management consumer interface on the front end of the home search. When you put together the smart home initiatives, the Zap commitment and the CBX, those are three great examples of where the brand is leading their agent population down a path. And how do you decide what to focus on? How do you know what your agents’ needs are? We have a field organization across America led by brand ambassadors in offices every single day. We have a training organization that’s out every day. We have Coldwell Banker events, both regional and national, throughout any given year, and we always have feedback opportunities there. Beyond that, we need to get outside of the Coldwell Banker box and see what’s happening from a different perspective, and that’s where industry conferences — like Inman Connect — are super important for us to be out there and understanding what’s happening outside the brand and what people are starting to develop. Realogy provides us a different opportunity there with their FWD events, a “Shark Tank”-like event for startup companies. And finally, we need to be understanding what’s going on in the world around us, and that’s really what led us to the smart home initiative. We participate in the Consumer Electronics Show every year, which is the largest gathering of tech providers in all kinds of spaces, and there are other channels as well, so that’s one example. We try to stay really close to our agents through the network, we want to stay really attuned to what’s happening in the industry, and we want to make sure that we’re also watching what’s happening across the country as a whole. How do you think that your experience as a real estate executive has influenced your own habits and opinions as a consumer — if it has? I think I’m more aware, but I’m a baby boomer, I’m probably one of the youngest baby boomers that’s out there, I’m sort of at the very tail end. Unfortunately, my tech knowledge and new media knowledge is probably more mid-level baby boomer than closer to Gen X — so that being said, one of the things about living in this industry and staying close to what’s happening with innovation is it’s made me much more aware, much more open to experiment and trying personally with new technologies. I also happen to have children, a 21-year-old and a 17-year-old, and it’s astonishing to me to really see how they experience and view things differently, through themselves and their friends. One thing that has trickled up to me is this move to mobile. I personally am very mobile, I use my iPhone for everything, in a way that I probably wouldn’t have if I hadn’t watched it happen with my kids. The other thing that hasn’t quite trickled up to me is media in general. The change between the 17-year-old and 21-year-old — the 17-year-old doesn’t watch TV. It’s all on the internet, and it really shows the pace of change as it happens, even in the four years between my two kids. Is there anything else you’d like to add before we let you get back to your first day? I’m excited to be back with Coldwell Banker; it’s where I got my start in this industry, and I learned a lot from people like Jim Gillespie and Alex Perriello and Budge Huskey, and it was a great run at ERA. I have great admiration for the brokers and agents in that system, and we accomplished great things — and that’s a brand to watch, the growth at that brand over the past five to seven years have been phenomenal.